AIHOLE TEMPLES - Peep Into The Past AIHOLE TEMPLES - Peep Into The Past - Shiva Maha Purana, Vishnu Purana, garuda purana, bhavishya purana, skanda purana. Off the beaten track of modern progress, situated in Bijapur district of Karnataka, on the banks of the Malaprabha river, is a squalid little village known as Aihole, originally known as Ayyavole. The place name has a legendary origin and is associated with Parashurama, who having destroyed the whole race of Kshatriyas came to Malaprabha river to clean his bloodstained axe. It is said that the water of the river turned red after washing the axe and at the sight of the river, he cried out ‘Ai Holi Ai Holi. Thus the place came to be called as ‘Aihole’. Nearly fourteen hundred years ago, Aihole was the capital of the Western Chalukyan rulers. Here are many ancient stone temples and two rock-cut caves all vying with each other in artistic beauty and architectural form. The atmosphere around these temples has now entirely changed; in i lie sanctuaries no oil lamps burn, nor is there any scent of flowers, nor sound of bells followed by chanting. In short, mi rituals are held and it is no longer a place of pilgrimage w here devotees could effect communion with gods. Aihole was an important centre of early Western Chalukyan kings during the 6th to 8th centuries. Once a neglected village, it has now been revived and improved with good roads connected with many towns around the region. The village contains superb specimens of temples, and is considered as the ‘cradle of Hindu temple architecture’ where the art of temple building evolved in various stages for many centuries.. lt is said that around the region were more than 125 temples, some of which go even beyond the Chalukyan time. constant excavations are continued bringing to light more temples lost under the cover of earth. The oldest temple at Aihole and perhaps one of the earliest in India is that of Lad Khan built around 450 A.D. It was converted into a residence by a prince of that name in later years. Thus a Muslim name was given to this edifice. It has a primitive air about it with a cave-like appearance noticeable especially in the massive pillars with bracket capitals and the flat roof. It has no ‘Sikhara’ of any sort. This again points to the cave prototype. Over the central bay of the hall is a supplementary Storey, probably of the later period, which too has a flat roof. The remarkable feature of the temple, however, is the location of the cella which, contrary to the normal practice, is built in the central portion against the back wall. The temple is approached by a porch with twelve square pillars. The first row has Yamuna on one side and Ganga on the other. Amorous couples are carved on the other two. On the outer walls of the temple to the north, south and east are pierced windows to light from outside. The decorative details upon this temple are expressive; the latticed windows lend a pleasing contrast to the plain wall. The pillars in the front show life-size images in bold relief. At the western entrance is enshrined a figure of Garuda. Originally, this was intended for Vishnu, but it now houses a Shiva Linga. In the centre of the pillared hall is a large Nandi. There is a rectangular shrine on the roof and three sides have the idols of Vishnu, Surya and Devi. Another shrine which deserves notice, is that of Meguti Jain temple. This must have been the last temple built at Aihole as it is precisely dated as 634 A.D. According to the inscriptions, this structure was built by Ravikirthi during the reign of Pulikeshi II. This temple is located on the spur of a hillock overlooking the village and has a fortified enclosure reached from below by a flight of crudely set steps. It is a .lain temple built in a purely Dravidian style ot architecture showing projections, and pilasters along the outer face. The outer walls of this shrine are all plain. Within the cella is seated on the throne against the back wall, a Jina or Tirthankara. An exquisitely carved sculpture of the Yakshi Ambika seated on a lion can also be seen here. All the outer niches are empty. As this temple stands on the hill, it came to be called as ‘Megan Basadi’ (meaning upper temple) which in course of time was corrupted into Megudi or Megiti. Kontigudi or Kwanti Gudi is another flat roofed temple with massive square pillars. ‘Konti’ means ‘Trident’; The locals say that some tribals called Konta had lived here encroaching the temple. Here are finely executed figures of Tandava Shiva, Varaha, Bhairavas and Vamana. The entrance to the shrine has a Garuda on the lintel which indicated that it was originally a Vishnu temple. The pillars are massive . and clumsy. The door of the shrine is flanked by ‘dwarapalas’. The Durga temple in Aihole is decidedly one of the finest peri mens belonging to the late 7th century. It outbids the rest of the shrines both in artistic form and aesthetic sense, lt has an undivided chamber and is unique in that it is built on the lines of a Buddhist Chaitya with an apsidal shaped . cella over which rises a little spire or ‘Sikhara’. As in Buddhist Chaityas, there are two rows of columns that divide tin hall. The pillars are square and heavy and contain sculpture of dwarfs in amusing attitudes. The outer walls of the shrine have beautifully carved figures of Narasimha, Mahisuramardini, Varaha, Vishnu, Shiva and Ardanarishwara. Pierced windows are provided in pleasing Patterns to allow light into the hall. In the local dialect, it is called as ‘Durgada Gudi’ meaning ‘temple inside the fort’. According to them it is not a temple of Durga but a temple for Vishnu as the ten incarnations (Dash avatars) are symbolically represented in this temple. Some historians attribute the temple to Surya, the Sun God, because of the presence of his effigy and other solar symbols. Huchchamaligudi is a temple with a ‘shikhara’ over its shrine in the Northern style. There is a plain porch with heavy square pillars, leading to a large hall encircling the main shrine. Two of the four pillars in the centre have pieced stone screen between them. The top of the shrine is decorated with carvings on the ceiling. On the porch is the figure of Karttikeya seated on a peacock with attendants. 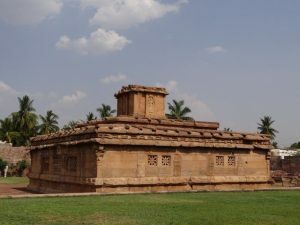 Huchhappaya temple is to the south-west of Aihole. This is another massive structure having a ‘shikhara’ in the Northern style. On the sides are niches containing carvings of Narasimha and Bhairavas. The lintel of the doorway shows a figure of Garuda. It is presumed that this shrine was dedicated to Harihara. No less interesting is the rock-cut cave. One of the most interesting cave, it is known as the Ravana Phadi cave temple, which is a rock-cut shrine belonging to the 6th century. It is unique among all the monuments and probably the oldest of such a type excavated in rock. It lies to the north-west of the village. The cave is made up of a hall with two pillars in front and an ante-chamber behind. On either side of the front hall are two chambers containing beautiful life size sculptures. On the left side of the hall is ten armed Shiva in ,a dancing posture and to his left is a small figure standing, whose head is missing now. Next to it is the figure of Parvati and at the end is a horse-headed female figure with two other female figures. On Shiva’s right is an interesting short figure of Ganapathi engaged with his favourite food ‘modakas’. The pilaster of the hall contains a beautiful figure of Ardanarishwara form of Shiva. In another corner is a form of Shiva with an axe and trident on either side, holding up a cobra by its tail in his right hand and a chain hanging from his left shoulder. On the other side of the hall stand the figure of Harihara-the conjoint form of Vishnu and Shiva. Though both the figures look alike at a passing sight, yet there are differences in their form and appearances. The sculpture of Varaha in the cave is quite interesting Mill Ins physical strength well depicted in the limbs and body. Varaha form of Vishnu was very popularly worshipped in the early centuries and the Western Chalukyas had in their royal seal the emblem of Varaha. Adjoining this is the figure of Mahishasuramardhini slaying the buffalo-demon. carries all her characteristic weapons and the lower end of her trident is plunged into the demon’s body. In a corner of the hall are the figures of Shiva and Parvathi with the sage Bhringi behind. There is no doubt that the Aihole art of the 6th century was purely indigenous and independent. Chronologically, a temple at Chikka Mahakuta, a site little known to scholars, marked the beginnings of Chalukyan movement. It is obvious that the Chalukyans experimented with different types of temple building styles, testifying to their integrity and sense of innovation. As at the ruins of Hampi, the mind suffers at these edifices and the intricate representation of deities created more than fourteen centuries ago. About three decades ago, one could not think of visiting Aihole to see these gifted monuments. There was no road and no proper conveyance. But today, a fine motorial road has been laid and a rest house also has been built. At the back of Durga temple there is a museum which houses beautiful idols belonging to this region collected from temples. The nearest railway station is Badami which would be the best base to visit Aihole, Pattadakal and a few other places around. Aihole is only 46 kms, from Badami and regular bus service operates to this village. Taxi or jeep can also be hired at moderate charges. There is a tourist rest house at Aihole but Badami would be the most convenient place for overnight stay. Authorised guides are also available.